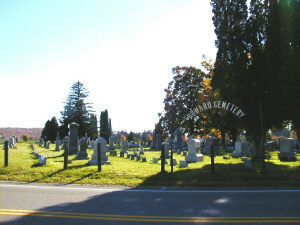 Located just on the outside of the hamlet of Howard a large cemetery and very well kept. Former name of this cemetery was the Greenfield cemetery. The original map of the cemetery burned in a fire in 1956 at the home where it was kept, so all the older graves have no record left. and please let one of us know if you find someone not on this listing. Read in 1978. Parcel of land given for the cemetery by Jason J. Green, deed at County Clerk's Office in Bath. Transcribed & submitted by Annette Campbell. ALBEE, Rosmary Lannoye , born Sep 26 1965 , died Mar 30 2012 d/o Raymond Albee & Kil Pok, b. Inchon, Korea d. Robert Packer Hosp. Sayre, Pa.
COOTS, Nellie "N.C." , Spouse of Henry Coots , born Feb 1858 , Died 1944 nee Gifford, "Mother"
DELL, Mae E , Born 189? EDGETT, Francis , Born 1866 , Died 19?? EVERRITT, Mary S. , Spouse of Orin Oliver , Born 7 Sep 1827 , Died 11 Apr 1900 "Orin Oliver Everritt, b. 1828 Killed Wilderness d. 5 May 1864"
HIGGINS, Louise A , Born 1838 , Died 19?? LEIGH, John M , Born 1849 , Died 3-08-1865 , Age 15y 7m 10d Son of David & Jane Leigh "maybe should read Daniel & Jane Leigh - Typo ?"